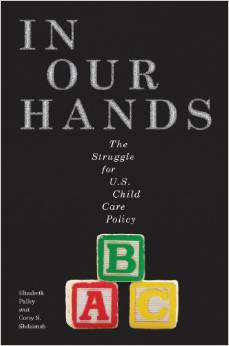 In In Our Hands: The Struggle for U.S. Child Care Policy, Elizabeth Palley and Corey S. Shdaimah explore the reasons behind the relative paucity of U.S. child care and child care support. Why, they ask, are policy makers unable to convert widespread need into a feasible political agenda? They examine the history of child care advocacy and legislation in the United States, from the Comprehensive Child Development Act of the 1970s that was vetoed by Nixon through the more recent policies that support quality early education and universal pre-kindergarten.